US President Donald Trump (right) has had many foreign policy successes. His diplomatic efforts with the Democratic People’s Republic of Korea (North Korea) would be among them. Using a maximum pressure campaign of sanctions, coordinating with South Korean and Japanese allies, and garnering help from China and Russia, Trump got North Korea to suspend nuclear and missile testing, brought home three US prisoners, and convinced North Korean Supreme Leader Kim Jong-un (left) to meet for denuclearization talks. Trump said the talks achieved much. Critics opined widely in the US news media that Trump accomplished nothing. After Trump won the 2016 US Presidential Election, Trump, forever the optimist, expected much from the presidency. Among those things, he would have liked to have been embraced by the country. However, he was rejected by an endless list of critics. As critics’ attacks hold the US public’s attention day after day, managers and producers in newsrooms insist that reporters and anchors push even harder to garner even more attention. To the extent that the public has been captivated by stories about Trump, he might be called the luckiest thing to come the way of US media outlets. Some of Trump’s critics are convinced that he does not really want to do well for the US public or the world. Trump is depicted more and more as the ultimate and absolute evil. Against Trump, more critics than not engage in “violent and disorderly forms of speaking: slander, defamation, insult, vituperation, malediction, and curse.” In doing so, critics transmit pessimism. However, they abuse the privilege of their position in the society to display a type of recklessness and irrationality. It certainly is nothing smooth, elegant, beautiful, or classy about it. It is very unattractive. As greatcharlie has asserted often in its posts concerning the news media, this would all prove to be very destabilizing for the society as whole. They make very unconstructive statements being fully aware that the consequence of them might be to harm the trust that many in the US public have in Trump. They may have even infiltrated and despoiled the psyche of quite a few, and perhaps may have even destroyed the possibility for some to have confidence in future US administrations. Indeed, if it were only a select few critics, perhaps it could be presumed that some strong psychological disturbance was the cause for their reports and commentaries. Their words could be dismissed. However, the number of critics is great, and there are far more than a few attacks. The onslaught of attacks against Trump are so intense that critics can step away from the firing line and allow others carry on the attack. They can then return later, rested, re-energized, and ready to unleash more destructive attacks on the US President. The ranks of Trump’s critics actually extend beyond the US news media to include: think tank scholars, other policy analysts, particularly former officials of the administration of US President Barack Obama. Still, it is via the news media that all of the critics views are transmitted. Trump did not ascend to the presidency only to have the US simply to sit back and hope only a well-heeled, politically “useful” segment of the society prospered. That was the pattern in previous administrations. When they tried to be proactive, they failed. After September 11, 2001, there was the necessary but poorly prosecuted military intervention in Afghanistan where initial success was squandered, and years with little genuine efforts by the administration to achieve victory. There was a non-judicious use of US power based on the silly notion of using a Western model to transform societies in the Middle East, marked by the disastrous Iraq War. Sizing up the competence of US decision makers, Russia moved forces into Georgia, and inroads were made in pulling some former Soviet republics back to Moscow’s control. There was a poorly conceived plan for nuclear arms reduction and an attempted pivot to Asia based on the flawed belief that the Russian Federation under President Vladimir Putin was no longer a threat to the West. Russia wholly rejected the notion of cutting nuclear arms and when he found the doors of Eastern Europe open, he decided to walk right into Ukraine. Russia directed threats at the Baltic States, conducted hybrid warfare campaigns against other former Soviet republics and Eastern European countries, and undertook the bold move of meddling in the 2016 US Presidential Election Campaign. Trump will not allow the US to sit and atrophy. He wants to take on the unfinished business of the US concerning foreign policy. He has had a number of objectively recognized successes. Perhaps first among was his efforts on the Democratic People’s Republic of Korea (North Korea). 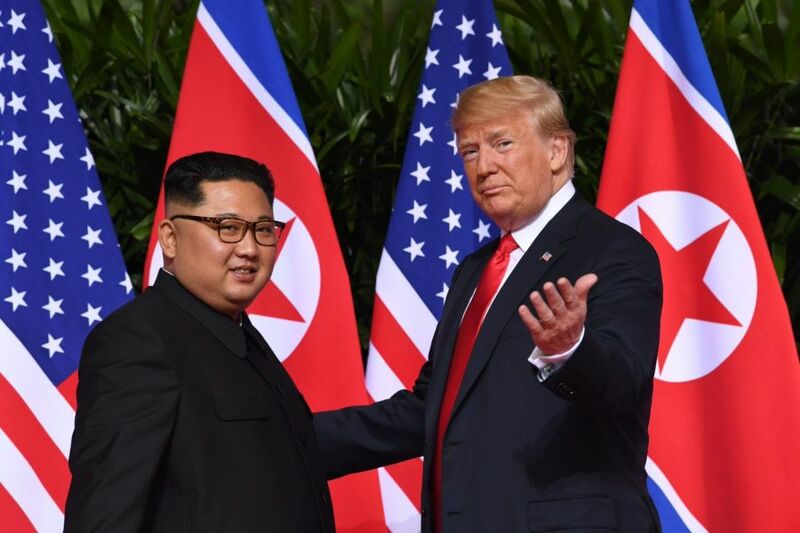 Trump managed to cause North Korea to suspend its nuclear and missile testing, release three US prisoners, and bring the Supreme Leader of the Democratic People’s Republic of Korea, Kim Jong-un to a summit meeting in Singapore on denuclearization on the Korean Peninsula. It was mainly the result of maximum pressure campaign that included harsh economic sanctions, close coordination with South Korean and Japanese allies and apparent help from China and Russia. On NATO, Trump encouraged Member States to increase spending following harsh admonishments of them for being delinquent in keeping their forces strong enough to field an effective defense against its most likely adversary, Russian. On March 5, 2018, NATO allies reported an increase in their overall military spending for a second straight year to 2.42 percent of gross national product. On ISIS, it was reported on April 5, 2018 by US Marine Corps Lieutenant General Kenneth McKenzie Jr., Director of the Joint Staff, that the US and its coalition partners in Iraq and Syria has led to near defeat of the so-called “Islamic Caliphate” and the methodical reduction of the massive swath of territory it grabbed in Iraq and Syria during the Obama administration. Chief Pentagon spokesperson Dana White explained further that “(We are) very close to reaching an end state against the caliphate.” These accomplishments are only a few from long list of successes. Initially for Trump, there was undoubtedly some hurt as he likely felt attacks were coming from all sides; and they were. Indeed, the intention of critics has been to hurt Trump. Psychological torture is always the most successful and painful for the individual. There was always the danger that as a normal human being, he could have become a misanthrope, so angered by what was being said. It is difficult to imagine critics did not know Trump would have been made to feel cornered, cut off, isolated. Trump was depicted within the society by critics as something wrong, abnormal, an untouchable. To maintain his balance, Trump appears to have engaged in an internal juggling act. The military would call it economy of force, bringing up strength when and where he needs it, and devoting less energy where it is not needed immediately. He apparently manages to find some peace and calm in his quarters at the White House. It is an environment of “friendly superiority” away from the savagery of critics, even if only for brief moments. He has occasionally found other opportunities for relaxation through visits to Mar-A-Largo, Trump National Golf Club in Bedminster, Trump National Doral Golf Club, and Trump Tower. Now, well over a year since his inauguration, the best efforts of his critics have left Trump somewhat untouched for the most part. Indeed, what critics might have noticed lately is that Trump has been reacting less to critics’ attacks, and typically responds in a way to promote his own perspectives, positions, and policies. In addition to rallies and press conferences, he does that work on Twitter. While critics may dwell on inaccuracies or typos which are undoubtedly the result of Trump’s attempts to fit all he wants to say in limited character space, the important elements to take away from his tweets is that they represent his own unfiltered words, his direct line of communication with the US public. Where Is the US News Media Headed? Taking the tack of reporting only parts of a story, promoting a particular viewpoint, hoping to shape in agreement with it, is improper. In the past, there were no special circumstances that would have made it correct to do so. It is not posited here that all journalists and all news media outlets engage in this practice. To posit that all members of any group behave in the same way would be incorrect unless they behave in the same way by design. Members of military honor guard close order drill teams, synchronized swimming teams, and some factory assembly line teams are a few examples of that. The desire here is not generalize to the point of displaying a prejudice or bias about the journalism profession or the news media or express stereotypes about both today. The purpose is to consider certain relatively new changes in standards of practice among professionals that catch the eye. Mainstream news media outlets rushed to create places for themselves online but it was an anxiety filled effort as their sites, carrying the mastheads of their venerable newspapers of record, revered broadcast television networks, and cable news networks floated in an ocean of seemingly infinite sites. Senior executives believed a solution for the mainstream media was to acquire, merge, or enter cooperative arrangements with the online competitors thereby covering matters beyond the news. There was certainly a flap of that activity in the late 1990s. Yet, despite steps taken, senior executives of mainstream news media outlets recognized that they were fighting a losing battle. At a certain point, it appears that since the mainstream could not beat the wave of online news services doing things representative of their buttoned down way of thinking. They would dedicate a portion of their efforts on the internet to directly compete with their burgeoning technological rival for the attention of the US public. In the presentation of their website sites, blogs, and stories, the mainstream news media outlets modelled their products after the many news sites online. It was a period of confusion across the profession in which senior executives saw that their inherent uncertainty and hesitation over departing from its normal ways of doing things was in an odd way a “liability.” The resistance to change would not allow it to compete with the new online threat. The response of many forward thinking at that moment in the industry was allow some latitude for shedding its “old fashioned” identity. That identity, however, was built upon the adherence to its firm standards of professional practice. There was opposition to what was transpiring. Although the transformation of the profession and its practices seemed inevitable, some well-experienced journalists and grizzled, seen-it-all editors and producers were not ready to toss out everything that had been established. Indeed, away from the eyes of the public there was an internal resistance by some journalists, editors, and producers to maintain the status quo and convince their colleagues that it was imperative to do so. Despite their intransigence, the winners of that apparent, yet publicly unseen Kulturkampf in the US news media were those in the profession who were ready to engage in ways that previously would have been absolute anathema in the profession. Veteran journalists might suggest that multifarious crises in leadership and changes in leadership along the way in the big US news media outlets further aggravated matters and sped the departure from old practices to the new. The trust developed over decades with the US public, the covenant of the free press with people, not to fail in its duty to keep them informed in the way mainstream news media outlets and the renowned freelance journalists of the past, became a patrimony squandered by spendthrift heirs. The new focus would be based on narrow interest in grabbing headlines to promote readership and viewership, and to fill advertising space and increase their profits. After all, new office buildings, new technologies, and marketing cost money. Those journalists who will adhere to convention, will only report facts as they come and in rightful context, will remain neutral, and will refuse to deviate from that course, may not be able to produce reports with enough “umph” to compete with the visceral, personal opinion-laden, stories of journalists working without restraint. Wrong is wrong, even if everyone is doing what is wrong, and right is right even if no one is doing what is right. Still, some would claim that is too easy to say outside of context, and therein may lie the problem. Too many journalists are willing to engage in a type of relativism about issues. Too many who see what is wrong are willing to settle as well. Difficile est tenere quae acceperis nisi exerceas. (It is difficult to retain what you may have learned unless you should practice it.) Debating whether standards should be upheld, regarding Trump or any matter, would have been considered novel in the profession not so long ago. Journalist, editors, and producers knew that they were expected to hold themselves to high standards. When the news is edited for the purpose of manipulating opinion it becomes propaganda, or worse, disinformation. As the profession developed, evolved, the need to apply standards to ensure that the reported news remained authentic news had been addressed by those who were responsible for developing news reporting as a profession; the firmament of great journalists of past eras. Standards are as essential an element to reporting as knowing the who, what, when, where, why of a story. Where one might appreciate hearing the matter still hashed out are lively discussions in ethics classes at journalism departments of colleges and universities. However, once away from the safety of the halls of their schools, the gap between theory and praxis, text and the world, becomes most apparent. There was a time when journalism was a calling. For the those who accepted it as such, there was a recognition that they had to remain obedient to standards. In moments of doubt when new journalists are uncertain how to proceed, it would be great if they would acknowledge, believe, that the profession is greater than themselves. Among new journalists willing to escape or to reject convention, there is also the impetus of trying to avoid being crushed under the weight of huge student loan payments, mortgages, college tuition, and some have expensive choices for entertainment and costly personal interests. Add to that the fact that most young journalists despite protestations to the contrary, are vertically oriented, seeing a path upward. For a young journalist, remaining part of workplace may often be just a matter of falling in line with what is expected, or acknowledging what is the style du jour. Although one may begin at the bottom of the list, once one is recognized as a team player, easy to work with, more opportunities to might be provided for one to participate in collaborative efforts. Fruitful group effort makes ones activities at a workplace much sweeter. In the era of Trump, new journalist are more likely to garner favorable attention as a team player and rise in standing, if they can manage to display some Innate sense of how to present him as a certain kind of leader. What can likely be expected in the future of the administration are efforts to create an image of Trump, much as a character in a play, with bits and pieces of fact included in their depiction. They can then convey anything negative about that character that they want. Can the Old Form of Journalism Be Resuscitated? In the Induction of William Shakespeare’s The Second part of King Henry the Fourth, the idea of Rumour takes human form, painted full of tongues, and breaks the fourth wall by speaking to the audience before the castle at Warkworth. He tells of his devilish work of playing on the anxieties across the known world, telling lies, generating falsehoods, encouraging guesswork, igniting suspicion, and flavoring speculation that could only mislead those aware of his presence. The result is misfortune for those fall victim to his stories. As an introduction to the play, Rumour tells how contrary to the truth that King Henry who has won the war and ended the rebellion led by Hotspur and his allies at Shrewsbury, he has spread word Hotspur has killed the King and as Prince Hal was killed, too! Rumour describes his efforts as follows: “Open your ears; for which of you will stop The vent of hearing when loud Rumour speaks? I, from the orient to the drooping west, Making the wind my post-horse, still unfold The acts commenced on this ball of earth: Upon my tongues continual slanders ride, The which in every language I pronounce, Stuffing the ears of men with false reports. I speak of peace, while covert enmity Under the smile of safety wounds the world: And who but Rumour, who but only I, Make fearful musters and prepared defence, Whiles the big year, swoln with some other grief, Is thought with child by the stern tyrant war, And no such matter? Rumour is a pipe Blown by surmises, jealousies, conjectures And of so easy and so plain a stop That the blunt monster with uncounted heads, The still-discordant wavering multitude, Can play upon it. But what need I thus My well-known body to anatomize.” The similarity in the practice of Shakespeare’s Rumor and practices of many journalists and US news media today is striking. As initially mentioned, opinion has replaced fact in news reports. Opinions themselves are not threatening. The way in which they are being used is problematic. Opinions can be developed by the interpreting facts collected and inferring things from that information. It is akin to trying to find the missing piece of ring and using facts available to conceptualize, hypothesize within reasonable probability, what that missing piece might look like. There are quantitative and qualitative means used in some fields to help one reach useful conclusions. Opinions can also be formed from prejudices, self-serving ideas, incorrect assumptions, and surmisal, and offered up much as rumors. The US public should be deeply concerned about the collapse of standards of professional practice in journalism, particularly when it comes to covering Trump’s foreign policy. Many in the US public have become less certain that the news media serves their interests. If new and veteran journalists and senior executives of new media outlets were forced to face the reality that the news media as it is now is not serving the needs of the public, there would most likely demurrals from some and certainly hot-blooded, vehement expressions of outrage from others. Trump appears to have triggered the worst attitudes and behaviors, the worst instincts in journalists. His presidency has oddly presented an opportunity for them to cut loose, engaging in independent thinking on what is relatively right and wrong and reaching conclusions at odds with professional standards. They respond to Trump with their worst instincts. While his foreign policy successes can reasonably be seen as improving the position of the US and peace and security globally, they are reported as placing the country and the world one footstep from Hell. Trump is inspired by the challenge of dealing with what he sees as the languid condition of US foreign policy. So far, there is no indication that his work is directed at the annihilation of everything as some critics have proffered. There is perhaps little to no chance for Trump to cultivate the affections of the US news media. One may disagree with Trump, but that is no reason to tear everything apart, play a big role in sullying the office of the presidency, and disassemble all that was once special and sacrosanct about journalism profession. This entry was posted in #Trump, 2016 US Presidential Campaign, 2016 US Presidential Election, Afghanistan, Alexander Pope, An Essay on Man, AOL, Baltic States, Chief Pentagon Spokesperson Dana White, CNN, Democratic People's Republic of Korea, denuclearization, Donald Trump, God, Internet Caucus, Iraq, ISIS, Kim Jong-un, Kulturkampf, Mar-A-Largo, Mark Edmond Clark, MSN, NATO, New York Times, Obama, Pew Research Center, Pivot to Asia, Putin, Russia, Russian Federation, Russian Federation President Vladimir Putin, Russian Federation President Vladimir Vladimirovich Putin, Singapore, Supreme Leader of North Korea Kim Jong-un, Supreme Leader of the Democratic People's Republic of Korea, Supreme Leader of the Democratic People's Republic of Korea Kim Jong-un, The Crimea, Trump, Twitter, Uncategorized, US Department of Defense, US Marine Corps Lieutenant General Kenneth McKenzie Jr., US President Donald Trump, US Senator John McCain, Vladimir Vladimirovich Putin, Washington Post, Yahoo, Yahoo! News by greatcharlie. Bookmark the permalink.